Here is the test: Your best friend or your one true love makes you stand in front of the lamp-post, he cuts the lamp-post and he knows how far it will fall down, but he won’t tell you and you are there standing with him seeing the lamp-post fall down towards you – what would be your first reaction? Normal folks – that’s what most of us are who are born with all their senses working great and have no disability – physical or mental of any kind. We the ones who can think rationally and consider ourselves superior to the disabled – our first reaction would be to save ourselves from the falling lamp-post. That’s the rational thing to do – but Jhilmil the autistic girl does not leave Barfi’s (who is deaf and dumb) side – she is the only one who passes his test. Neither his best friend of years and nor his first love Shruti stand beside him, not trusting his judgement of where the the lamp-post will fall . That scene summed up the entire movie for me – love is all about trust and belief. Barfi as a movie is by far the best I’ve seen this year (Kahaani and Ferrari ki Sawari my other favourites, and yes I’m not a Gangs of Wasseypur fan ) – it narrates a simple tale of love lost and love won. That there is no love if there is no trust. Barfi born deaf and dumb and brought up by his dad is loved by all in the small town of Darjeeling. The town inspector is perpetually chasing him for the pranks he keeps playing unknowingly or knowingly. Shruti – the lovely doe-eyed rich girl moves into the town with her parents one fine day and Barfi falls in love with her at the first sight. Shruti is engaged but still starts falling for Barfi’s innocent charm – who wouldn’t? When her mother comes to know about her feelings, like any mother would , she advises her daughter about the perils of the relationship – Barfi is not only handicapped but also very poor. Shruti moves on and gets married but never finds love again. She then meets Barfi again in Kolkata after 6 years but this time he is with Jhilmil – his autistic childhood friend and seeing them both together Shruti realises what true love is all about. How Barfi gets together with Jhilmil, how he loses her, and how Shruti helps in him getting back with Jhilmil is what the rest of the movie is about. There is no great story in the movie – it’s fairly straightforward but the best story-tellers can make the simplest of stories enthralling and you must give Anurag Basu credit where due. He takes us through the lovely locales of Darjeeling, the mini trains, the greenery, the Kolkatta of 70s and you fall in love for the first time. Then we are introduced to Shruti – Illena gives a stellar performance in her first Hindi film. Her eyes (despite the highly irritating fake eyelashes) do all the acting – she expresses so beautifully through them that you do not feel the need for any dialogue from her end when she is communicating with Barfi. Her dilemma and confusion is heartfelt and not even once do we feel that her love for Barfi is out of sympathy for his disability. I don’t know if you agree but I found an uncanny resemblance between Illena and Manisha Koirala of the 90s when she had made her debut – in movies like Saudagar and 1942 a Love Story – Illena’s innocent face and more importantly her eyes make her the perfect fit for playing Shruti. I’m no Priyanka fan – if people are going to head to the theatres expecting that she has pulled off what Sridevi did in Sadma, please be prepared to be disappointed. Of the 3 leading actors, Priyanka was always going to be the weakest link and she did not disappoint me on that aspect. Her portrayal of the autistic girl was a tad overboard, but I’m not complaining as she did well within her limited acting capabilities. In fact in couple of scenes she did manage to hold fort – especially the one where she gets Barfi back and stands in front of him not letting Illena come close to them or the last scene where she pats Illena assuring her that all will be well. The supporting cast – especially Saurabh Shukla in the role of the inspector, Barfi’s best friend, father, and Roopa Ganguly as Shruti’s mom do a good job. Some might feel the movie drags in some places but the scenes have been shot so aesthetically and the characters speak less and emote more that I really did not care if it slacked a bit in pace. 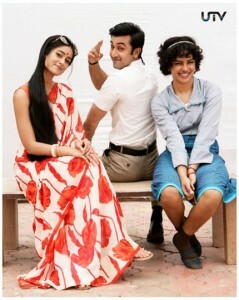 But Barfi is really about Ranbir – it rides on his shoulders and he sails through with great aplomb. He pays a fine tribute to Charlie Chaplin in many moments in the movie and makes you smile and cry at the same time. He excels in each and every scene – be it comedy or tragic. When he first proposes Illena, when he learns that she is his engaged and goes back to asking her to be just friends, his every attempt to steal a glance of her, his constant pranks on the inspector, his attempts to get the 7000 Rs to pay for his father’s surgery be it the kidnapping or the bank robbery, his reaction to his first kiss, his realisation of why he will never be fit to be Shruti’s husband – that scene where he outrages – the only time that the ever hopeful guy feels he is hopeless is par excellence – Raj Kapoor would’ve been very very proud of his grandson. His attempts to entertain Jhilmil , taking care of her, and eventually falling in love with her and going to all lengths to find her. Ranbir as Barfi epitomises love in every sense of the word – his innocence is so endearing that you wonder why on earth would any girl not want to be with this guy despite his disabilities. The beauty of Barfi’s character is that his disability is incidental to the film and not the core plot of the theme – the movie is about love – falling in love, losing it, and winning it back. Sawaali Si Raat where Ranbir entertaining Jhilmil, helping her get over her fears & getting back her faith along with Arijit’s rendition soothes your heart like no other song can. I rarely rarely cry in my real life so forget crying at movies but Barfi had me misty eyed throughout. I literally broke down during the scene when Barfi gets Illena home and introduces her to Jhilmil. You can feel Illena’s heartbreak and Barfi’s joy when Arijit’s version of Phir Le Aaya Dil plays in the background. If you loved and chose to lose it and then saw him/her move on when you realised you wanted them back; you will identify with Illena. If you loved and lost and then found the one true love you have been waiting for; you would identify with Ranbir’s joy. I did not take to Arijit’s version of this song earlier but after seeing the scene in the movie it is playing in my head and on the ipod in an infinite loop! I can hardly recollect any dialogue from the film but I can recollect so many scenes that touched my heart. The characters talk to us – through their face and through their eyes. You feel their pain and you live their joy. Barfi is just so pure – yes in every aspect the film overflows with simplicity and purity and that is so rare to find these days in Bollywood films. If you have experienced love – go relive it again with Barfi, if you have not fallen in love go watch Barfi to know how beautiful and painful it can be ! First time was about falling in love with the characters, their relationships, the awesome music and getting absorbed in the era of the movie.. The second time was about loving Ranbir’s performance even more and noticing every inch of the frame that was shot. As per the saying ‘beauty lies in details’. This movie gives justification to this phrase. each and every scene captured in depth. by absorbing the expression of every scene makes you so involved. Absolute delight. Thanks – well said – every actor in the movie emotes and talks through their eyes/expressions – minimal reliance on dialogues. Wonderful review, I couldn’t believe how wonderfully everything came together. Didn’t think it was too long, I loved every minute of it and even the extra sweet parts didn’t feel out of place. Hats off to Ranbir Kapoor and Ileana D’Cruz – they just told the story so well. Also have to hand it to Pritam, lifts music but chooses it well. My favourite parts – both the letters Barfi wrote, one to Ileana’s parents and the ransom note (Aapki beti hamare kasbe mein hain) are masterpieces! I was amazed when people actual cribbed about the length of the movie – I didn’t even realise it was that long. Really well written, about a well made film. I tend to agree with most reviewer who said a tad too long, and the ‘circular reference’ flashbacks could have been done without. Having said that, this is truly one of the better films out of Bollywood in recent times, without doubt. ps. another scene worth note is of the one where Ranbir and Ileana are waking away from the special people home, and only Illeana hears Priyanka’s screams, leaving her with a ‘life and death’ moment of choice. One wouldnt wish such choices one one’s worst enemies. Bharath bang on about that scene. I did not write about that scene just in case I revealed too much – that was such a crucial scene to the whole story – And needless to say Illena was superb once again!